The vast majority of energy we use today is derived from the burning of fossil fuels such as oil, natural gas, or coal. A carbon footprint, as commonly known, is simply the weight of carbon or carbon dioxide emitted into the atmosphere each year from the burning of fossil fuels. The carbon footprint, however, can be expressed in other ways that are more useful and more consistent with the original ecological footprint concept: the area of the Earth's surface needed to absorb those emissions. On average, it takes roughly 41 acres to absorb one ton of carbon emissions. Other gases that contribute to global warming — such as methane from waste — are converted into "carbon equivalent" units then added to the carbon footprint. We estimate the carbon emissions from your congregation's use of electricity, natural gas and other fuels. Carbon emissions from congregations and staff travel. Carbon emissions associated with food, office products, cleaning products, and everything else your congregation purchases. Emissions from landfill waste (mainly methane) converted into carbon equivalent units. Then we give credit for lands your congregation may manage in their natural state as carbon sinks and for any carbon offsets your congregation has purchased. We provide your congregation's total footprint in both pounds of carbon and in acres. Once you calculate the footprint of your facility, what about your congregants? The "Cool Congregations" workshop is a stewardship program to help your congregants measure and reduce their household greenhouse gas emissions. It won rave reviews in Iowa where it was developed by Iowa Interfaith Power and Light. If you want to learn more about this workshop for individuals, please email us at info@InterfaithPowerandLight.org. 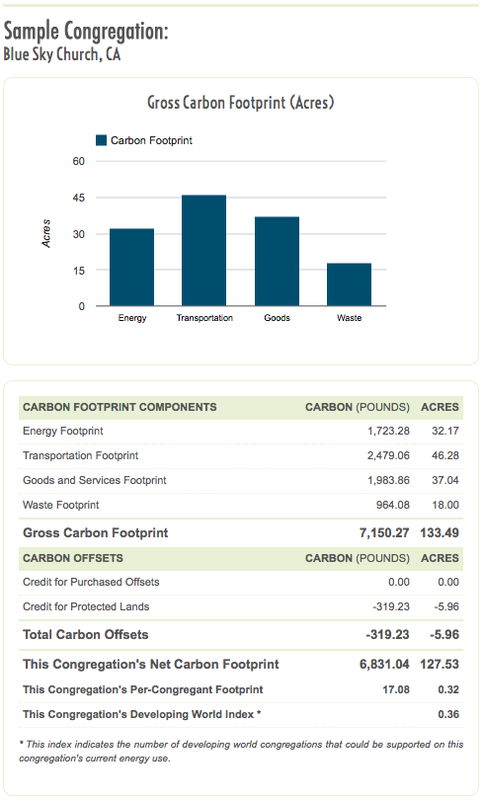 You can also use this online calculator for households to help congregants shrink their carbon footprints.